It’s a problem that has long plagued the fashionable: How do you find a stylish way to tote the many cosmetics and accoutrements necessary to maintaining your lavish lifestyle, while also proclaiming that you’re into classic hip-hop? Stopgaps such as shoving your eyeliner and pashminas into the vinyl sleeve for Straight Outta Compton only result in a cumbersome mess, while toting a regular purse and simply telling people you like hip-hop whenever it naturally comes up in the conversation is so confining. There has to be a better, more expensive way. And as always, that’s where Gwyneth Paltrow comes in. 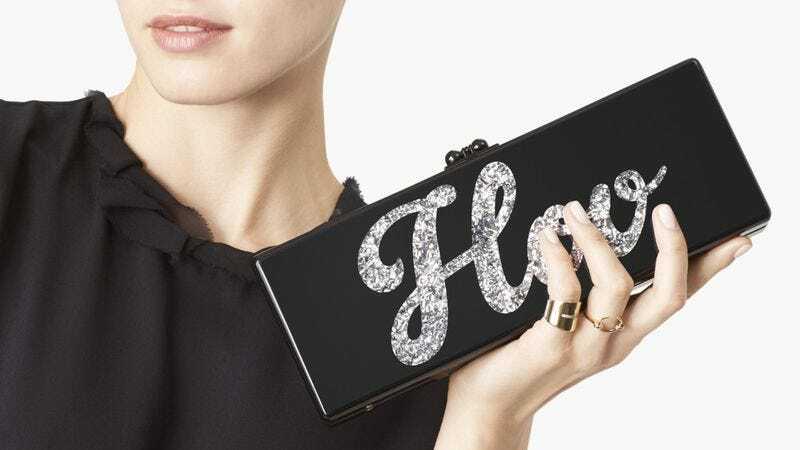 Paltrow’s Goop, the hype man for dangerously gluten-free MCs, has announced an exclusive collaboration with handbag designer Edie Parker on a line of “hip-hop themed clutches.” Paltrow—a self-proclaimed hip-hop fan who’s been known to tasteful-porcelain-bust a rhyme herself—personally commissioned the clutches to be emblazoned with the names of “just some” of her favorite rappers, including one that says “Hov,” in honor of her close, personal friend. Those of you who have not summered with him in the Hamptons may know him by his more formal name, Jay Z. The other side of that clutch reads “Shady”—a possible reference to Eminem, or perhaps it’s just the sort of gazebo where Paltrow prefers to enjoy Hov’s songs. Likely to cause a violent turf war wherever designer goods are sold, Goop is also offering a clutch with “Biggie” placed back-to-back with “Pac.” So divided in life, these murdered rappers have been reunited in death and in “pearlescent, pool-blue acrylic”—a shell that’s every bit as tough and able to withstand a night out on the town as they were, up to a point. What better way to honor them, other than listening to their music and that’s it? The inside of every clutch also features a mirror, so you can open your Biggie/Pac clutch and take a long, contemplative look at yourself and ask what all the fussing and fighting is for, anyway. Can’t we all come together in mutual appreciation of the empowerment of rap, and its ability to convey a hip, streetwise edge to luxury cosmetic cases? Yes we can, for the modest asking price of $1,695 apiece, a tribute to the insane amounts of money that have been milked from appropriating hip-hop culture and the legacies of dead rappers. However, be aware that there’s currently an eight-week wait, during which time you’ll have to find some other way to convey your twin loves of rap and needlessly expensive accessories. Maybe start your own lifestyle website?